What: The “big picture”—there is a long-standing effort to understand the mechanisms of explosive lava–water interaction on Earth and Mars. It is important to be able to distinguish those volcanic features on Mars that have formed from exclusively by “dry” volcanic processes from features that involve lava–water interactions. This is crucial important because it provides information about the volcanic and hydrological history of the planet—a topic of considerable interest in the context of possible life on Mars and understanding its paleo-climate. This project will contribute to our understanding of lava–water interactions by acquiring detailed observations of known examples of lava–water features on Iceland and comparing their attributes to possible martian counterparts. We want to use observations made on well-constrained terrestrial features such as volcanic rootless cones (VRC) to be able to confidently interpret unknown features on Mars. Who: Andrew de Wet, Franklin & Marshall College; Christopher Hamilton, University of Arizona, Stephen Scheidt (Instructor), University of Arizona and 6 students. The Laki eruption occurred in southern Iceland during an eight-month period from June 8, 1783, to February 7, 1784 (Thordarson and Self, 1993). The eruption released 15.1 ± 1.0 km3 Dense Rock Equivalent magma, of which 14.7 km3 was erupted as lava and 0.4 km3 as tephra. The eruption progressed as ten en echelon fissure segments propagating northeast to form a 27-km-long fissure with associated lava flows covering 599 km2. The distal-most ash from the eruption extended into Europe, but the majority of the tephra volume occurs close to the source vents. Additionally, the Laki lava flow includes dozens of VRC groups (e.g., Guilbaud et al., 2005; Hamilton et al., 2010a, 2010b), most of which have not been examined in depth. Subaerial explosive volcanic eruptions generate volcaniclastic material that may be dispersed into their surroundings by a variety of mechanisms. The three dominant mechanisms are: (1) ballistic dispersal; (2) vertical fall deposits that “rain out” from a convective ash plume; and (3) pyroclastic density current (PDC) deposits that are associated with the lateral transport of material as flows and surges. Understanding the dispersal patterns associated with each of these mechanisms is vital for inferring the energetics of a volcanic eruption (e.g., Fig. 1). Figure 1. Example of a well-exposed volcanic rootless cone (VRC) deposit in Iceland, which provides an example of contrasting emplacement styles. Higher energy deposits tend to have a longer thinning half-distance (i.e., length scale over which a deposit’s thickness will decrease by half) than lower energy deposits. Thus, while Unit 2.2.2 has a greater maximum thickness than Unit 2.2.1, Unit 2.2.1 is actually an example of deposit produced by a higher energy explosion because it is more widely dispersed. 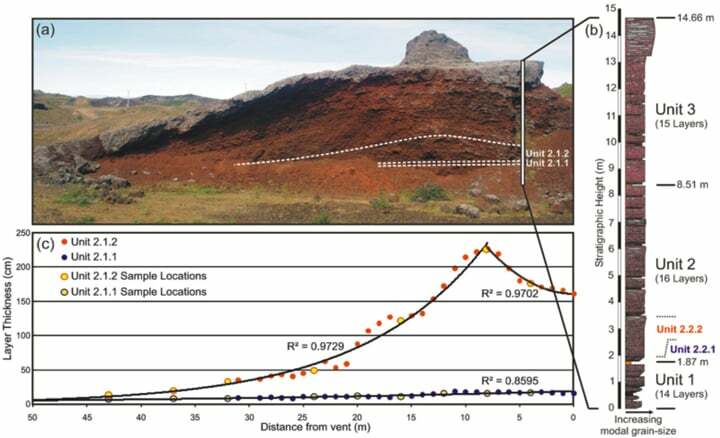 In situ field observations also show that Unit 2.2.1 is the product of tephra fall from a weak volcanic plume, whereas Unit 2.2.2 is dominantly the result of ballistic tephra dispersal from weaker transient explosions. In general, more highly energetic eruptions will tend to have deposits that thin gradually over large distances from source, whereas weaker eruptions will thin more rapidly from their source. Pyle (1989) first described this relationship in detail and proposed a measurement called the “thinning half-distance”, which defines the distance over which a volcaniclastic deposit will thin by half. However, to account for variations in this distance with measured direction from source, the original formulation uses the square root of area of an isopach (i.e., contours of tephra deposit thickness) to determine the length scale. Thinning half-distance relationships, expressed as plots of the logarithm of deposit thickness versus the square root of area covered by the corresponding isopach, are commonly used to characterize and compare explosive volcanic eruptions (Bonadonna and Houghton, 2005). In general, these plots show that the deposit thickness tends of taper off exponentially with distance from source, thereby implying a continuum within the depositional process; however, in some cases—especially where higher resolution tephrastratigraphy data is available—the thinning half-distance relationships are often better described by two or more log-linear relationships, which implies transitions from one tephra emplacement regime to another, such as a transition from the dominance of ballistic tephra emplacement near the vent to fall deposits farther from source. Learning how to construct and interpret tephra-thinning relationships is therefore vital for understanding and correctly interpreting the geologic record and inferring volcanic eruption processes. However, typical thinning-relationships can be complicated by secondary factors such as the elutriation of fine-grained material from laterally moving PDCs and debris flows, which may generate secondary plumes and fall deposits. Additionally, the presence of water—either during a phreatomagmatic eruption or due to external weather phenomena—can modify tephra dispersal characteristics by favoring the collapse of convective plumes into PDCs, or triggering the flocculation of fine-grained ash into larger particles that prematurely rain out from an eruption plume. In addition to these processes, we have observed another secondary process that can significantly modify isopach distributions. This process involves the interaction between lava flows and external water, which may trigger the formation of explosive lava–water interactions involving a combination of ballistic, air fall, and PDC activity. Previously, such secondary tephra deposits were thought to be very minor, but our preliminary work demonstrates that volcanic rootless cone (VRC) groups can produce secondary tephra deposits can be traced nearly 5 km from their source (Fig. 2). Figure 2. 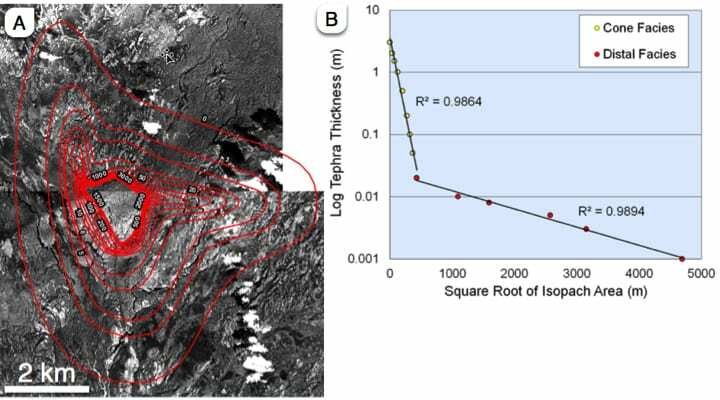 A: Isopach map showing contours of tephra thickness associated with a volcanic rootless cone (VRC) group near Leidolfsfell in the Laki lava flow. B: Plot of tephra thickness (on a log scale) versus square-root of isopach area. This example shows that while the overall thinning relationships appear to follow an exponential relationship, the data can also be fit by two log-linear relationships, including a proximal cone/platform facies and a distal tephra fall facies. In the field, students would collect additional samples to better characterize this transition and determine the tephra emplacement processes associated with this rootless eruption. (Figure based on preliminary data acquired by Dr. Hamilton). The overall goal of the Keck project is to use observations made on well-constrained terrestrial features such as volcanic rootless cones (VRC) at Laki to be able to confidently interpret unknown features on Mars. There is a long-standing effort to understand the mechanisms of explosive lava–water interaction on Earth and Mars. It is important to be able to distinguish those volcanic features on Mars that have formed from exclusively volcanic processes from features that involve lava–water interactions. This is crucially important since it provides information about the volcanic and water history of the planet—a topic of considerable interest in the context of possible life on Mars. This project will contribute to our understanding of lava-water interactions by acquiring detailed observations of known examples of lava–water features on Iceland and comparing their attributes to possible martian counterparts. 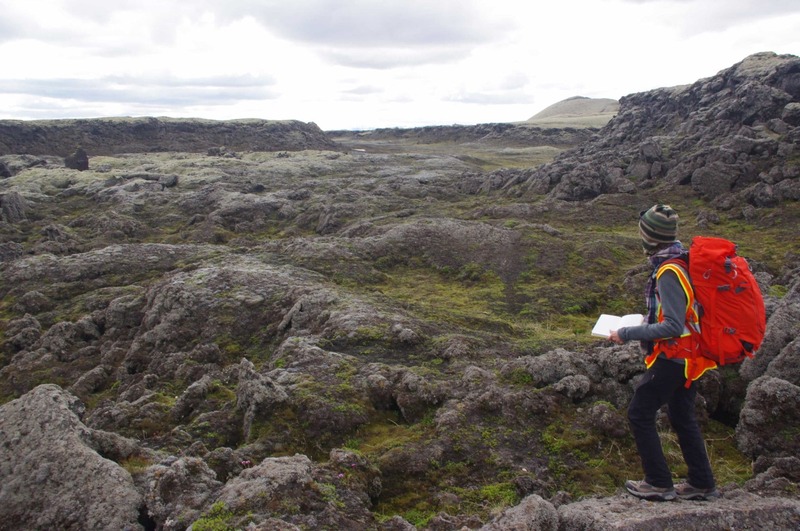 As part of the Keck project, students will examine examples of magmatic, pheatomagmatic, and secondary tephra deposits within the Laki lava flow in Iceland and develop field-hand investigations of the physical characteristics and dispersal patterns associated with magmatic, phreatomagmatic, and secondary eruptions and learn how to distinguish between ballistic, fall, and PDC emplacement mechanisms. a) A general introduction to magmatic and phreatomagmatic eruptions as well as lava flows and lava–water interactions. Initiated in Reykjavík and continued at field sites close to Reykjavík and at Laki. b) Examination of tephrastratigraphy and ground penetrating radar (GPR) surveys of VRC tephra deposits at the Rauðhólar cone group near Reykjavík, to develop each students’ understanding of the internal layering structure and stratigraphy within volcanic edifices. c) Examination of Laki tephra layers and tephra stratigraphy, as well as an examination of the tephra dispersal patterns from two VRC groups within the Laki lava flow. d) Examination of lava characteristics near the Laki fissures and in the vicinity of Mt. Leidolfsfell, where the lava passed through a narrow constriction before entering the Skaftá River gorge. Based on this orientation the students will then select from several specific projects. Since the specific skills, equipment and software required for the projects varies we will make sure to carefully match the student interests, skills and home institution facilities with appropriate projects (we anticipate that some discussion will occur prior to the start of the field work so that we are comfortable that the selected projects can be completed at the students’ home institution). All projects will involve extensive observations and mapping in the field and some component of Geographic Information Systems (GIS) mapping and processing at their home institution. Some projects may focus heavily on remote sensing and geophysics while others will focus on the processing and analysis of physical samples. All projects will include a comparative study of analog martian features. While individual student projects will be structured as stand alone projects, ideally, the overall project will be most successful if the datasets generated by the individual projects are shared. The project faculty will make sure that all the necessary field observations are made available to all the students after the end of the field season but prior to the beginning of the fall academic semester. Additionally, we will work hard to share the results of individual projects as appropriate during the academic year. For example, students working on grain size analysis should complete the analyses as soon as possible in the fall and share this data with the other student(s) on the project. Depending on the success of the fieldwork in the Laki area we may spend the last week north of Vatnajökull examining the deposits of the very recent (2014 near Mt. 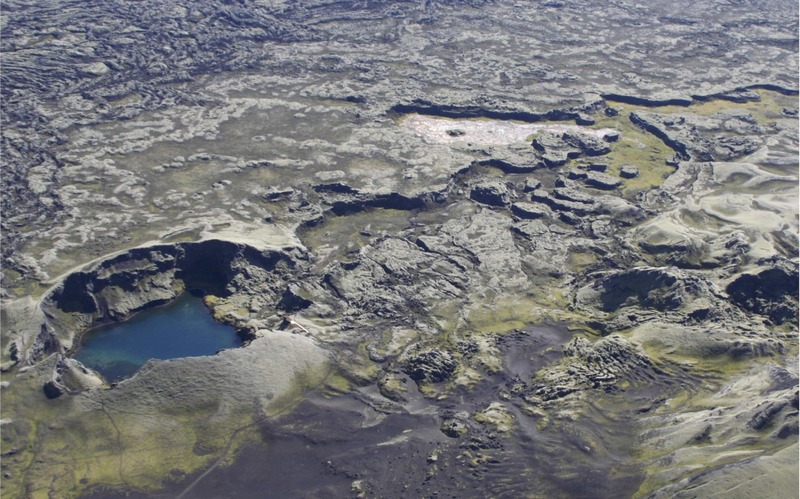 Leidolfsfell 2015) Holuhraun eruptions located between the northern and southern extensions of the Bárðarbunga and Askja fissure systems, respectively. This will allow students to compare and contrast the features at Laki with very recent and superbly preserved features associated with this eruption. There are several potential aspects to this general project. The students will likely choose to focus on a few aspects based on their interests and the available equipment at their home institution (or accessible at another institution). Tephrastratigraphy and dispersal patterns: Previous mapping that shows that the ash from the secondary eruption was dispersed over 5 km from the center of the Mt. Leidolfsfell VRC group, so this project will require upwards of 100 sample locations (~50 proximal and ~50 distal). Using the ~100 sample locations of layer thickness measured in the field, one or more students would compile the data into ArcGIS to build isopach maps, determine the thinning-half-distance of the deposit (Pyle, 1989), and identify facies transitions. One or more of the students will then use this information as the foundation for examining VRC deposit thicknesses on Mars. This would be achieved by importing stereo-derived Mars Recognizance Orbiter (MRO) High Resolution Imaging Science Experiment (HiRISE) Digital Terrain Models (DTMs) into ArcGIS, calculating a best fit surface to the lava, and subtracting it from the region where the lava surface roughness texture appears to mantled by VRC tephra (see below for an explanation of these DTMs). The resulting difference image would provide an estimate of VRC tephra thickness, which would then be contoured to develop isopach maps and thinning-half-distance measurements, thereby helping to compare the similarities and differences between the known tephra dispersal patterns in Iceland and the unknown ones for Mars. Grain-size: Details of the number and distribution of samples for this analysis will be determined depending on the number of students interested in this aspect of the project. For example, if two students are interested in this focus then one student could work on the grain-size distribution of the proximal tephra deposits with the other student focusing on the distal deposits. For each student, this would involve continued grain-size analysis by sieving ~50 samples at their home institution (a considerable undertaking!). The grain-size data would then be examined using a number of statistical methods, such as the Falk and Ward method of grain-size analysis, which is conveniently coded into the freeware GRADISTAT program. The data would also be plotted in ArcGIS to generate isopleth maps, which provide important information about the spatial variability in tephra grain-size, which is related to volcanic explosion mechanisms and dispersal processes. Grain-size information on Mars cannot be directly determined from the available remote sensing images from VRCs; however, it can be inferred based on thermal inertia properties of the surface materials. Thermal inertia can be calculated for the relevant surfaces using Mars Odyssey Thermal Emission Imaging System (THEMIS) system measurements using daytime and nighttime infrared (IR) measurements. If a student is interested, they could also use the sample material and an IR spectrometer to make laboratory measurements of the thermal emission and inertia to extend their terrestrial analog comparisons through the use of laboratory experiments. A subset of the samples will be examined for their componentry, morphology and shape. Componentry involves identifying the components of the volcanic material (e.g., lithics, trachylite, etc.). Componentry provides information about the different phases and explosive style of the associated eruptions. Morphology and shape provides additional information about the details of the volcanic processes forming the tephra deposits. The students will be able to compare ash from primary fissure related eruptions to ash from lava–water interaction related processes and then unravel the details of the processes that formed the Leidolfsfell VRC. Again the exact number and spatial distribution of the samples used for this work will be determined based on the number of interested students but ideally we would like all the students to work with their own set of samples to complete some or all of these analyses. Some aspects of this work can be done using basic petrographic microscopes while other analyses may require the use of XRF, XRD and/or SEM/EDX (cf., Andronico et al., 2014; http://www.sciencedirect.com/science/article/pii/S0377027314000298). The goal of this project is to characterize the 3-D internal structure of layering within archetypical rootless cones to better constrain cone and layer volumes, thinning geometries, and the relationships between internal structure and observed surface morphology. We plan to use a GSSI SIR-2000 GPR with a 400 MHz antenna combined with Differential Global Positioning System (DGPS) measurements. 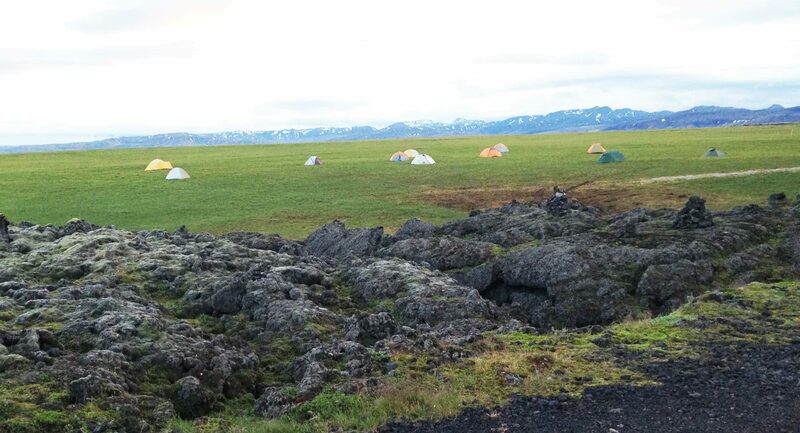 Study sites include the Rauðhólar cone group where Co-I Hamilton already has considerable experience working on VRC tephrastratigraphy within the Rauðhólar and Leidolfsfell VRC groups. After collecting the GPR measurements in the field (with supporting DGPS measurements to provide precision constraints on location and topography) the student(s) may wish to post-process the data at their home institution, depending on their interests, technical skills and access to software, into a 3-D tomographic map. Alternatively, the basic processing will be done by the project faculty and the datasets provided to the student(s). The necessary software to process the GPR data is available at F&M. The student(s) will then link the observed layering with stratigraphic logs (provided by Co-I Hamilton for Rauðhólar, student-collected data for other sites), calculate a number of quantitative metrics for the deposits, and synthesize their results. These insights can then be applied to stereo-derived DTMs of VRC topography to explore similarities and differences between the known terrestrial analogs and unknown martian landforms. We have already identified several study sites on Mars and the necessary data is available online from the NASA Planetary Data Center (PDS) (see details of the data below). Comparison with martian analogs will constitute a considerable component of this project. This project would focus on geophysics, remote sensing and GIS analysis. Students interested in examining lava flows and the context of VRCs on Earth and Mars would carefully describe and map the flow features associated with the Leidolfsfell VRC using DGPS and associated field observations (all the necessary DGPS equipment will be available in the field including 4 top-end Trimble differential GPS units, 10 handheld Trimble GNSS receivers, and 3 powerful laptop computers). They will then develop the mapping of lava flow features in the field into a remote sensing and GIS focused independent project. These students could be responsible for post-processing the DGPS data, or alternatively, the post-processing work can be done at F&M or University of Arizona. The students will then use their field observations and remote sensing data, such as aerial photographs, DEMs etc, to build a GIS database of the Leidolfsfell area. Resulting maps will be used to reconstruct the flow emplacement history in the Leidolfsfell area and infer the paleo-environments that favored VRC formation. This project would include a comparable study of the lava flow regions hosting the VRC groups on Mars that the other students are examining, thereby providing the necessary local and regional constraints on the formation of Leidolfsfell and martian VRCs. As indicated above, all the necessary Mars data is readily available online. Additional individual projects can be developed from any number of tasks related to: (a) additional GPR surveys of the Leidolfsfell region; (b) detailed examination of the componentry of the tephra samples collected from the Leidolfsfell VRC tephra and other locations; (c) ground-based stereo-photogrammetry and precision surveying using DGPS to generate DTMs of the Mt. Leidolfsfell VRC group and surroundings; (d) examination of the similarities and differences between VRC deposits and primary magmatic and phreatomagmatic tephra erupted from different vents along the Laki fissure; or (d) detailed examination of lava flow morphologies, sctructures, and textures to infer emplacement mechanisms. Each of these projects would provide important insights into the processes of lava–water interaction, and PI deWet and Co-I Hamilton will be happy to help tailor the suggested projects to best suit the interests of each student. Since the big picture context of this overall project is the better understanding and interpretation of possible Martian analog features, we hope that all the students will compare their Iceland work with possible Mars analogs. Carrying out a comparative study of Mars features will likely constitute a considerable part of some student projects but all students will be provided with a basic dataset that can be examined using ArcGIS to do some simple comparative analyses. Students who have more experience with ArcGIS may want to work with more complex data (DTM’s, etc.) and carry out more complex analyses. In any case, all of the necessary data is available online from the NASA Planetary Data System (PDS) or can be provided directly to the students by the project faculty. One of the exciting aspects of this project is that the students will work with a new type of data that allows for the 3-D study of significantly smaller features than has previously been possible. They can use data such as the low-resolution topographic data from the Mars Orbiter Laser Altimeter (MOLA), which is onboard the Mars Global Surveyor (MGS). However, a new type of DTM, derived from HiRISE stereo-pairs using stereo-photogrammetry, is revolutionizing the study of planetary surfaces by resolving, for the first time, the topography of outcrop-scale features from orbit. This technological advance has created a new frontier in terrestrial analog studies by enabling 3-D characteristics of landforms on the Earth to be directly compared to those on other planetary bodies. For instance, HiRISE stereo-images with 1 × 1 binning (0.26 m/pixel) can be transformed into DTMs with 1-m-postings and a vertical precision better than 0.5 m (Kirk et al., 2008). Such stereo-derived DTMs enable the morphology of Martian landforms to be compared to terrestrial analogs using precise field-based surveying methods, such as LiDAR and Differential Global Position System (DGPS) measurements. We will spend one or two days at the beginning and end of the project staying in hostels in Reykjavík. The rest of the time will be spent in the field. Weather conditions in Iceland are highly variable. Some days can be pleasant and mild while other days can be cold, wet and windy. The field sites are relatively remote. The nearest towns are many hours drive away over rough roads. In most cases travel requires crossing river fords that can be impassable for many days depending on weather conditions. We will endeavor to visit the nearest town at least once during the field season but there are no guarantees that will can or will occur. Expect to be in the field for up to 2 weeks without access to modern amenities. Accommodation: We will stay in hostels in Reykjavík. We will most likely have access to basic but comfortable huts in the field but all students should be prepared to camp if necessary. The hut at Laki can accommodate over 20 people but with very limited privacy. Typically many participants have elected to sleep in personal tents for at least part of the field season. Cooking, meals and other activities take place in the hut. The hut is not connected to the electricity grid; however, a generator will provide electricity for the purposes of recharging batteries (primarily for the drones, DGPS, cameras, computers etc.). Food: At Laki the hut has an adequate kitchen facility with a gas stove. Refrigeration is not available but with the creative use of coolers fresh food will be available during most of the field work. We will self-cater all meals in the field. Individuals will prepare their own breakfasts and lunches. Dinners will be prepared as a group. Reasonable dietary variations can be accommodated. Transportation: In the field we will use rented SUVs to get to the field camp and to get to field sites. Field work will involve varying amounts of hiking (up to all day) over variably rough terrain (think disrupted slabby pahoehoe covered in a thick layer of moss!). Water: No running water is available at the hut at Laki. Clean water is available locally so there is no need to treat water for drinking and cooking. Showers are not available in the field but adventurous participants can use a local lake for “showering”. The toilet at the hut is a “long drop/outhouse”. Internet: In Reykjavík and smaller towns internet service is usually available in hotels etc. No internet service is available in the field. Cell phone service: Depending on an individuals provider/cell phone – cell phone service is excellent in most locations near developed areas but maybe less reliable in the field. Weather conditions: The weather conditions are highly variable in Iceland. Expect some days to be sunny and pleasant (60’s–70’s) but much of the weather will be cool, windy and rainy. Typically it rains 50% of the time and the average daytime temperatures during July at Laki is 59ºF. Nighttime temperatures are much lower. Given the very changeable weather all participants should be prepared for long days in the field when conditions are favorable. Field work will likely continue when weather conditions are less favorable so come prepared with rain and cold weather gear. Overall expect the unexpected and don’t be surprised if plans change based on weather conditions. Landscape: the landscape is almost completely pristine and stunningly beautiful! !